Download one of our free scavenger hunts to deepen your next visit! Scavenger hunts can offer a little bit of structure to your trip and provide multiple opportunities for children to connect with our collection. 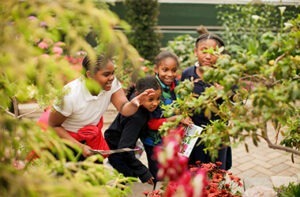 You and your family, or your classroom, can hone your scientific skills as you hunt for specific plants, make observations, and compare and contrast different plants. Scavenger hunts are benchmarked to Next Generation Science Standards for your convenience. Click on the links below to download PDF versions of each hunt. 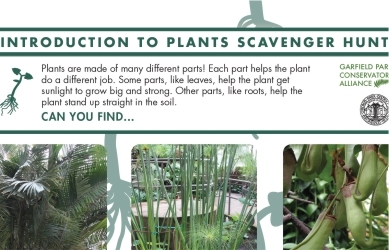 Developed as part of our School Programs Themed Resources series, this scavenger hunt allows our youngest visitors to engage in conversation about basic plant parts and plant functions. Search for giant leaves, roots that grow in the air, and more, with this exciting resource! 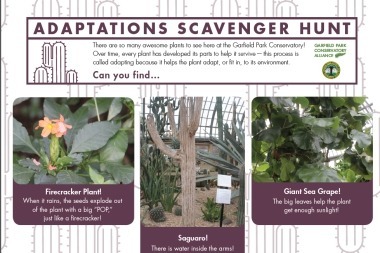 Developed as part of our School Programs Learning Experiences series, this scavenger hunt provides introductory information for our youngest visitors on plant adaptations. Every wonder why cacti have arms? What about why you always see bananas in pairs? Download this hunt for your next visit to find out why! Wouldn’t it be great if candy grew on trees? Well, in the tropics and here at the Conservatory, it actually does! 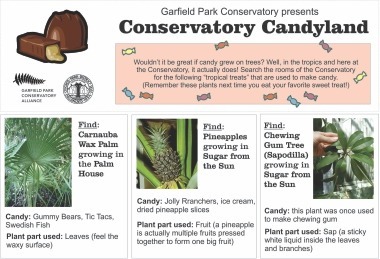 Search the rooms of the Conservatory for the following “tropical treats” that are used to make candy. (Remember these plants next time you eat your favorite sweet treat!) 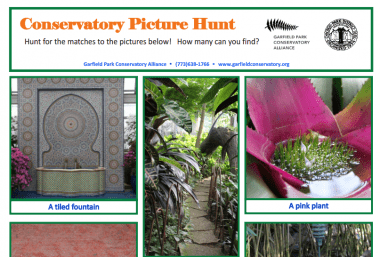 Conservatory Candyland Scavenger Hunt is aligned with State of Illinois Standards Grades: 5th-8th. The Garfield Park Conservatory is a wondrous place to explore! Hunt for the matches to the pictures! How many can you find? Can you find the secret path, a pink plant, a leaf bigger than you, or the animal tracks in the floor? 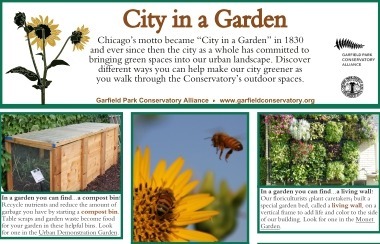 Chicago’s motto became “City in a Garden” in 1830 and ever since then the city as a whole has committed to bringing green spaces into our urban landscape. Discover different ways you can help make our city greener as you walk through the Conservatory’s outdoor spaces. 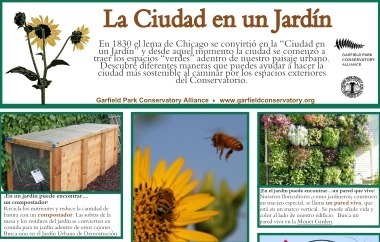 En 1830 el lema de Chicago se convirtió en la “Ciudad en un Jardín” y desde aquel momento la ciudad se comenzó a traer los espacios “verdes” adentro de nuestro paisaje urbano. Descubre diferentes maneras que puedes ayudar a hacer la ciudad más sostenible al caminar por los espacios exteriores del Conservatorio. Usa una mancha de tierra para marcar tu progreso mientras busca los elementos de jardines urbanos sostenibles. Encuentre todas estas plantas que son importantes en la cultura de Latinoamérica para ganar. 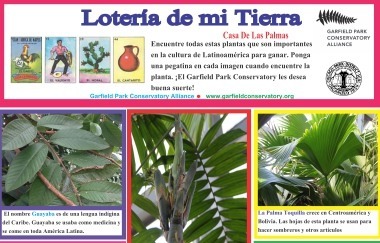 ¡El Garfield Park Conservatory les desea buena suerte!